​located in Deland, Florida. Feel free to browse the images below to see what can be installed in your yard or screen room...bringing paradise home...to you! 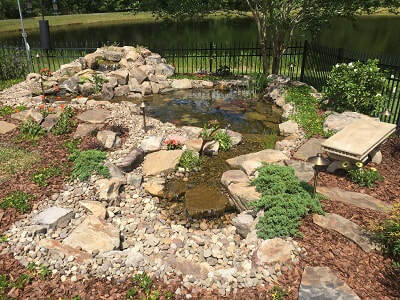 ​Pondless Waterfall - "Tranquil Falls"
Pondless Waterfall - "Country Creek"
​A beautiful disappearing pondless waterfall with a winding stream situated on this back porch will bring the sounds and beauty of nature to your living environment. Enjoy the relaxing sound of water as you watch the beautiful koi swim around in this 4'x6' ecosystem pond. This pond was created within the screened area connected to the back of the house. Awesome view and sound from within the house and of course sitting on the back porch! Water features provide homeowners with a unique and creative way to decorate their outdoor living space. Many homeowners desire the soothing sounds of running water, but are just not ready for a pond or simply can’t afford one. A decorative fountain provides the perfect solution for a small, entry-level water feature. Fountainscapes are decorative water features such as container water gardens, stand-alone fountains, bubbling stone, decorative spitters including fountains that incorporate an in-ground reservoir. 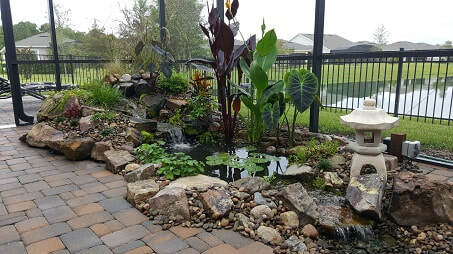 Click here to see some examples and more information on these unique water features from Tropical Water Gardens.